I have an indoor rosemary plant that I use for cooking. It has recently gotten powdery milldew. The smell of neem oil makes me nauseous, and I am also hesitant to use a milk-based spray due to potential smell as it gets old as well. Any other ideas for organic things I can use, considering I still plan to eat the foliage and it sits in a prominent area indoors? Dumb question, but can you smother it by coating the plant with olive oil? I don't know about olive oil. If you can move the plant to a less humid area like outside would be better where it will get good air circulation. Even a shady spot outside might be better than a humid spot indoors. If the powdery mildew is limited. I would cut it back. If it is all over the plant. You can try hdrogen peroxide which has some anti fungal properties. I would rather use sulfur instead. If you do use neem do it outside. I can't stand the smell of neem either, it gives me a headache. What about baking soda solution? I believe olive oil is considered too heavy. Maybe safflower? Should you find the need to react to an existing condition of powdery mildew, early detection provides the best way to contain and potentially eliminate the problem. There are many commercial products that are effective at containing the spread. However, eliminating an existing problem is not a given. Most conventional products are made for prevention and control, not elimination of an existing infection. Thatâ€™s why itâ€™s important to start a control program before powdery mildew occurs or at least at the earliest sign of detection. There are many retail, off-the-shelf fungicide products that are effective at treating mildew. One of the most common active ingredients used for control is â€œchlorothalonilâ€. Although effective, it coats the leaf surface with a white milky film that is quite noticeable. Baking Soda (sodium bicarbonate) -This is possibly the best known of the home-made, organic solutions for powdery mildew. Although studies indicate that baking soda alone is not all that effective, when combined with horticultural grade or dormant oil and liquid soap, efficacy is very good if applied in the early stages or before an outbreak occurs. Use this recipe to make your own solutionâ€”mix one tablespoon of baking soda with a teaspoon of dormant oil and one teaspoon of insecticidal or liquid soap (not detergent) to a gallon of water. Spray on plants every one to two weeks. You will still need to control the environment to keep mildew away and provide better air circulation and reduce humidity. I acquired the plant in September last year, it has been indoors. I put it above my kitchen sink as I read in an earlier post that rosemary is a coastal plant and likes a high humidity environment/to be misted regularly. The powdery mildew started maybe a month or two ago, just at the tips of the plant. I cut off the tips and didn't see any return until this week. Appears to be all over the plant now. Much as I would love to move it outside, average temps have been running in the 30's here lately. I don't know if it is a high humidity plant. I do know that it is fairly drought tolerant and once established it can live on rain so I don't think it needs a lot of misting. Misting and poor air circulation may actually promote mildew. Rosemary is hardy to zone 8. Once the temperatures are a little higher it can be gradually transistioned outside. It will do better there. Rosemary is native to the dry rocky areas in the Mediterranean, especially along the coast. I know you can get powdery mildew on Rosemary, but I've never had that problem. I think there was a mention some time ago that combination of high humidity and low temperature could promote mildew of rosemary, but how does powdery mildew look? I mean Rosemary is a pretty fuzzy downy, cottony kind of plant to begin with, some cultivars even more so during certain times of the year. Or is it that the affected stems and leaves turn brown and drop whole sale? I found out pretty early on that Rosemary does NOT do well when overwintered at higher temperatures -- they never do well in upstairs room that are 68Â°F or above and prefer floor-level on the first floor where temps could get as low as low 50's. Warmer temperatures combined with dry air almost always results in severe spider mite infestation, but it's hard to detect because of the fuzz -- signs are tiny white spots and mass leaf drop, then webbing. You must have different rosemary from mine. Rosemary is an aromatic shrub that likes it warm zone 8 and up. The leaves are shiny and a little bumpy but not fuzzy or downy. If it gets too much water it becomes a tree. The sprigs look like some kind of pine but it definitely smells of rosemary. I don't get very cold but in summer it gets to be in the 90's and it is still in full sun. I don't get much mildew either although I read it can, but mostly on indoor plants with high humidity and poor air cirulation. I have the high humidity but since it is outside, air circultion is not a problem. What I am plagued with are spittle bugs, but that does not come till later. This one is starting to show stress -- I should probably just put it outside already. I have heard similar things to what Applestar has said. 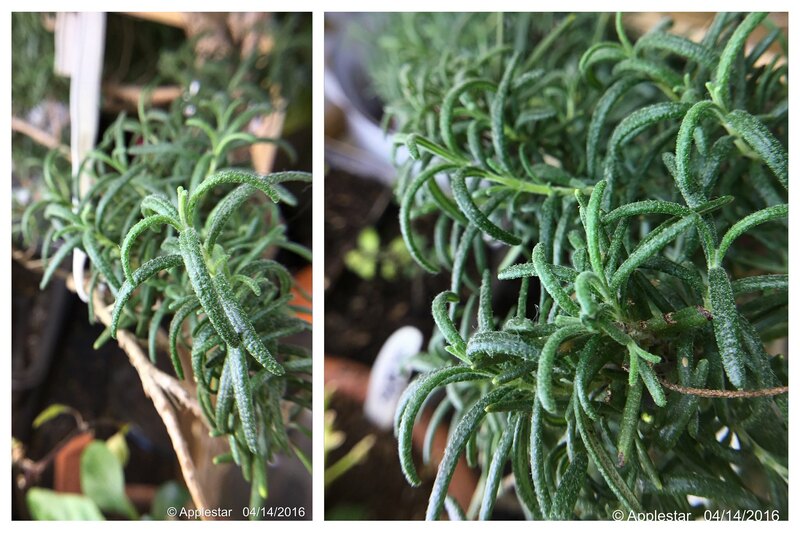 I used to have a hard time keeping rosemary indoors when I lived in an apartment because I had it in a warm, dry place (near a vent) and it got too dry. I started misting it daily and that helped it. Now that I am in a house, it seemed to be doing well above the kichen sink (also near a window so a bit colder than the rest of the house) until the powdery mildew showed up. I guess this plant is still trying to be understood and there are several different schools of thought! I am zone 5, so no way I can keep it outdoors. I think I will try the insecticidal soap + baking soda from imafan. Thanks! P.s. I do know it is powdery mildew because I had a chance to examine it under the microscope at work.